Get 6 months to pay $630.00 with PayPal Credit! No payments + no interest if paid in full in 6 months. Mountaineering will challenge you physically, mentally, and emotionally. It will humble you and it will reward you. 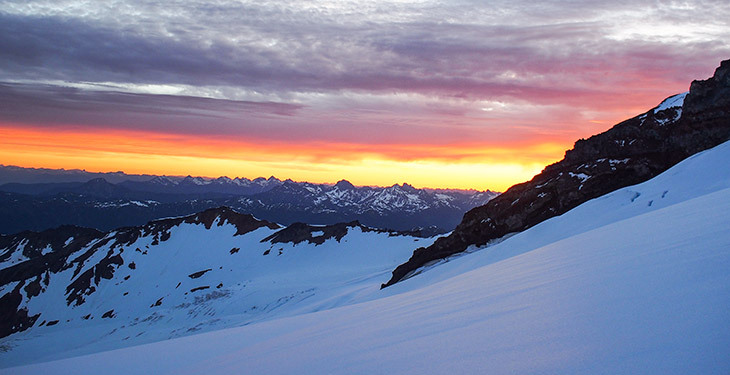 Northwest Alpine Guides will choose one of two standard routes on Mount Baker depending on mountain conditions at the time of the climb to ensure you the best chance of success. You'll climb either the Coleman Deming Glacier on the north side of the mountain or the Easton Glacier route on the peak’s southern flanks. Both routes are considered similar in length, elevation gain, and difficulty and offer a great introduction to roped glacier travel and basic mountaineering. Northwest Alpine Guides' professional instructors will introduce and teach you the skills necessary to make a safe and successful climb. The trip begins early on Day 1 in Sedro Woolley, so you should plan to arrive the day before. Northwest Alpine Guides will provide you with a detailed pre-climb departure book upon registration including personal gear list, meeting location, and driving directions. Your alpine guides will meet you this morning for team introductions, gear check, and group gear distribution. The drive to Schreibers Meadow trailhead at 3,400 feet takes approximately one hour and the drive to Heliotrope Ridge trailhead at 3,500 feet takes approximately two hours. Once on the trail, the hike to high camp will take 4-5 hours and the team will set up camp between 5,600 – 6,200 feet depending on the season. After arriving at high camp, you'll receive a one hour skills refresh and each team member will be assessed throughout the mountaineering instruction. You'll need to demonstrate adequate fitness and proficiency in climbing skills as your safety is top priority. Then return to camp and prepare for your summit bid. The team will enjoy dinner and head to bed early for the next day’s climb. Summit day starts early with a pre-dawn alpine start. From high camp, you'll climb moderate snowfields to the saddle between Sherman Crater at 9,600 feet or Colfax Peak at 9,000 feet depending on the route chosen. From here, it takes between one and two hours to reach the top. 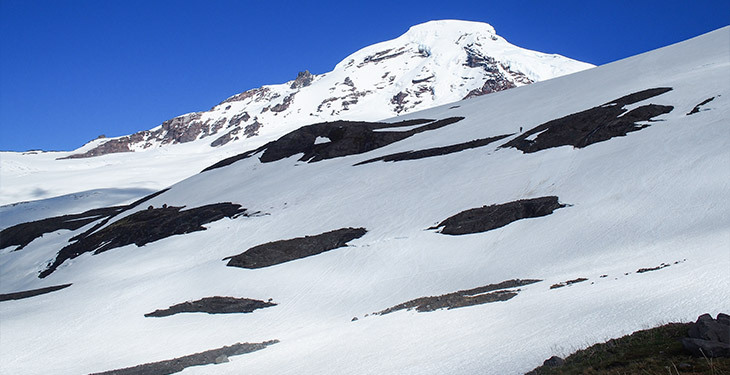 Both routes ascend the final Roman Wall steeply to Mount Baker’s expansive summit. 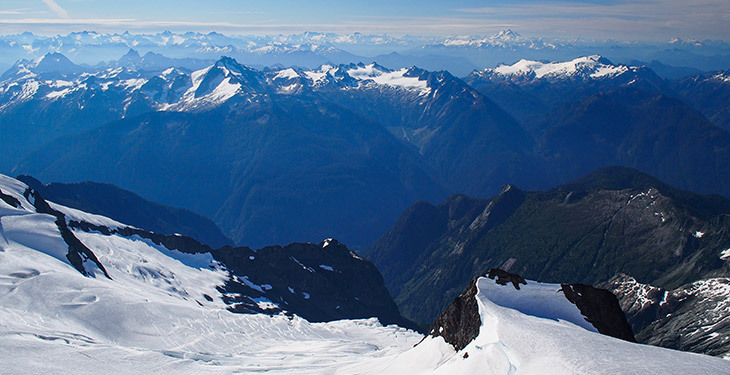 After enjoying summit views from Mount Baker’s highest point and celebrating your success, your group will descend the route to high camp. You'll pack your gear and retrace the hike back to the trailhead. You can expect to arrive back at the trailhead by mid-afternoon and conclude your adventure in Sedro Woolley. Plan to depart the day after the climb ends. 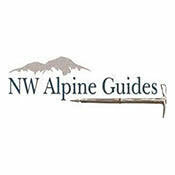 NW Alpine Guides makes every effort to uphold the scheduled itinerary. The guides are given discretion to adapt the itinerary for reasons beyond their control or due to the needs of the group. NW Alpine Guides are veteran mountaineers who believe in giving personal attention to each and every one of their mountain climbing customers. Celebrating over 20 years of guiding experience, Dennis has dedicated his entire life to exploring the remote corners of the world through trekking and climbing. Northwest Alpine Guides' parent company, Mountain Gurus, is dedicated to providing their clients with the finest international guides and world-class tour operators. They specialize in leading treks and tours, Northwest climbs and courses, and mountaineering expeditions to many of the most exciting destinations on Earth, including all of the Seven Summits. Thank you for the experience. Your company is first rate. I will make sure that anyone that I know who is interested in a climbing adventure must call you first. Thanks again for all of your guidance, support, wisdom, and encouragement on the mountain. The trip was amazing. Outstanding! Thank you! A wonderful adventure. 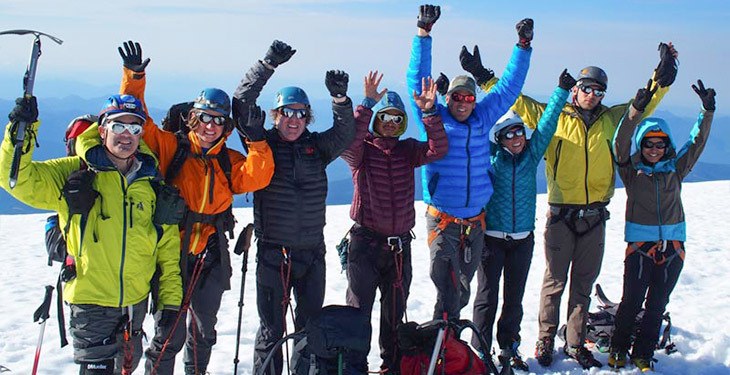 I summited Mount Baker with NW Alpine Guides last summer. The guide service is well organized and provided lots of helpful information about gear and logistics prior to the climb. Our two guides, Sam and Craig, had many years of experience and my girlfriend and I felt safe and well trained as we headed towards the summit. The weather was a bit overcast but it was an exciting day. I would definitely recommend Northwest Alpine Guides for any climb in Washington State. I believe they also offer other international climbs as well. There is a minimum of two participants required to guarantee each departure. Please do not make travel arrangements until you have received confirmation from Northwest Alpine Guides. Plan to meet your guides at 8:00 am on Day 1 of your trip. You'll meet in Sedro Woolley for an equipment check before heading to the trailhead. Northwest Alpine Guides will email you pre-climb information including gear list and departure details upon registration. The small town of Sedro Woolley, often referred to as “The Gateway to the North Cascades," is approximately 76 miles and an hour and thirty minute drive from Seattle or Bellevue depending on traffic. The nearby cities of Mount Vernon and Burlington offer more food and lodging options than Sedro Woolley. You'll be sharing mountaineering tents with other participants for the duration of the trip. You'll be at either Sandy Camp (6,000 ft) or Hogsback Camp (6,000 ft) depending on the conditions. Camping equipment is included and tents will be double occupancy, paired with someone of the same gender. During this trip, you'll need to provide all your own meals while on the mountain, including one breakfast, two lunches & snacks, and one dinner. 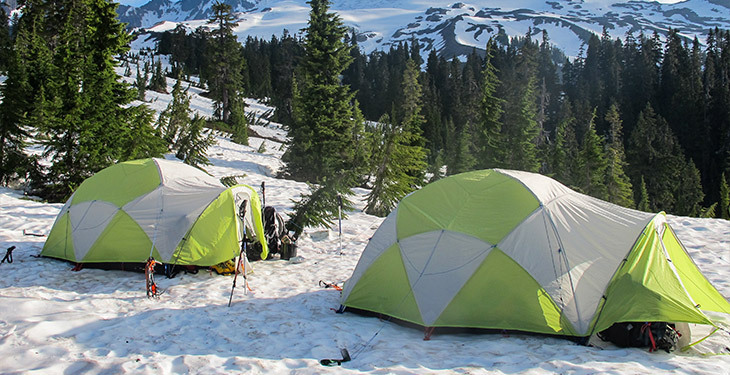 Northwest Alpine Guides will provide the group with hot water during breakfast and dinner. For lunches, NW Alpine Guides recommends a variety of snack food for eating on the go. You won't be stopping for a big lunch break, but rather you'll eat during short maintenance breaks throughout the day. The idea is to keep your energy level up for the climb, eating small amounts about every hour or so. Some examples of snack-lunch foods are dried meats (salami), jerky (turkey, beef, fish), tuna fish, cheese, crackers, bagels, dried fruit, nuts, chocolate, candy bars, gummy candy, cookies, energy bars, and GORP trail mix. The importance of having foods that you like to eat cannot be overstated. Eating properly is the key to maintaining strength while in the mountains. A diet of sweet, sour, and salty foods is recommended. Dinner: Freeze-dried dinners are easy to prepare but do not always taste good and may affect your stomach. Instant noodle soups and rice are also popular. You may also consider bringing a cold meal such as dried meats, bread, pizza, or sandwiches. Plan to bring $10 extra for a trailhead parking pass for two days (per vehicle), plus money for gratuities and anything additional you may need for lunch or snacks. 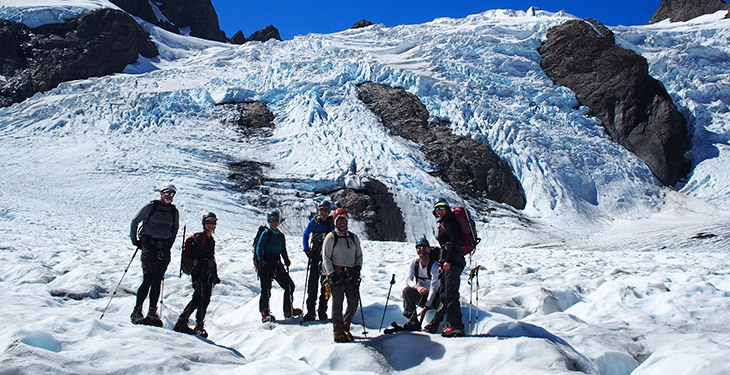 Northwest Alpine Guides will provide you with a detailed pre-climb departure book upon booking including personal gear list, meeting location, and driving directions. For your safety and comfort, it’s extremely important that you adhere strictly to the equipment list. Many items such as mountaineering boots, ice axe, crampons, harness, helmet, sleeping bag, clothing, etc. may be rented directly from Northwest Alpine Guides. How physically fit should I be for this trip? This ascent is an entry level summit climb and is suitable for climbers in excellent physical condition with no prior mountaineering experience. A one hour climbing skills training will be taught. No acclimatization is necessary for this program. Book confidently with Free Cancellations within 72 hours of booking. After 72 hours, cancellation fees will apply. Cancellations are subject to the full discretion of Northwest Alpine Guides. For more information on our Travel Cancellation Policy please Click Here.